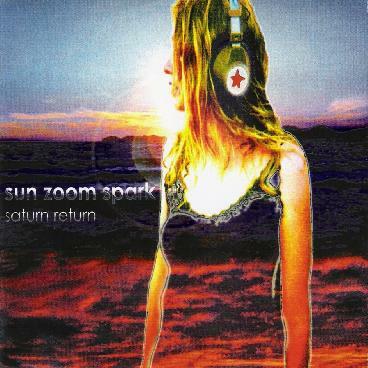 Sun Zoom Spark - "Saturn Return"
You couldn't ask for a more perfect slice of psychedelic pop rock than Dixie Cups and Valentines, the opening track on Saturn Return, the 5th album from Arizona's Sun Zoom Spark. Iner Space Trajity, another driving garage pop tune with spacey vocal effects and a nice eastern tinged jam in the middle follows it. They set the tone for an album of great tunes that cross back and forth over the boundaries of space rock and power pop. Fresh from his stint with Black Sun Ensemble, guitarist, songwriter and band founder Eric Johnson brings that band's Brian Maloney onboard to play bass and tenor sax (the latter of which we get to hear a great, groovy solo from on the first track of the album). The band is rounded out by J Ratcliffe on drums and Bobby Hepworth on Hammond organ, Rhodes piano and Prophet synth. It's nice to hear a modern psych band using keyboards as an integral part of each song, as the Hammond and Rhodes add colourful flair to the compositions, and the Prophet lends a spacey touch to the more extended instrumental jams like the album's third cut, the spacey and bluesy Long Days Journey Into Tonight. It's followed by another ripping power psych pop tune called Daughter of the Twilight, and the Zeppelinesque riffing of Silent Hearts Decline Your Invitation. At each turn the band injects new life into the album by trying new things, like the melancholic bluesy twang of the instrumental Well of Souls (featuring more great sax from Maloney) and fine psychedelic guitar work from Johnson. They follow that up with the crunchy psych/punk of You Bury Me and the nearly 8½-minute mellow but trippy space rock excursion of Glow Like Starshine (which has some lovely and haunting Rhodes playing from Hepworth). It's not the only time the band stretches out beyond the boundaries of the typical rock song. After the quirky, new wave styled title track, the stately and spacey blues cover of Freddy King's The Fool and the moody folk rock trip of All I Have Left of You, the band launches into the album's highlight, the dark 13½-minute space rock journey of Nocturnum, proving that this band is just as good at wild, freaky improvisations and electronic experimentation as they are at writing terrific, memorable pop tunes. Things finally wind down with one more song, a smoking cover of Camper Van Beethoven's Hideaway. Saturn Return is a great album for anyone who loves the varied sounds of the psychedelic 60's, played by musicians in top form, not all covered with the slick gloss of modern production; left so it sounds just right, coming from somewhere between the garage, the studio, and the stars. For more information you can visit the SlowBurn Records web site at: http://www.slowburnrecords.net.